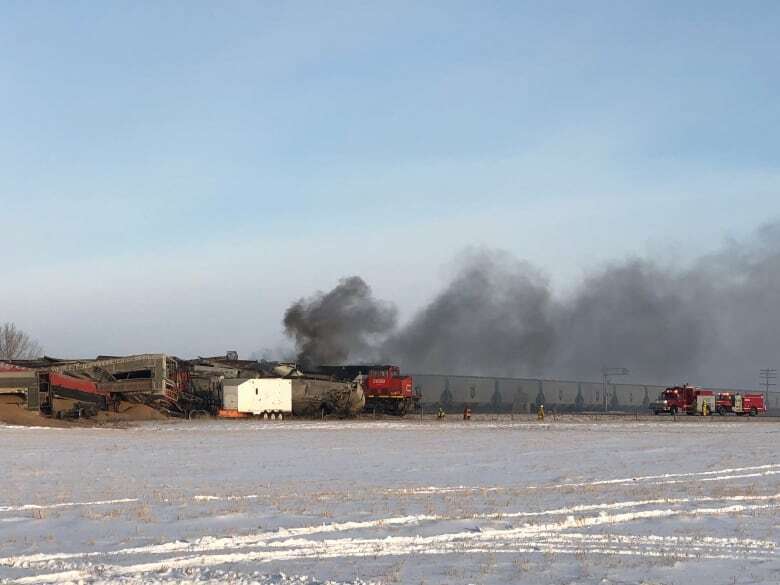 No one was injured after a train derailed and one locomotive caught fire just north of Saskatoon on Tuesday morning. 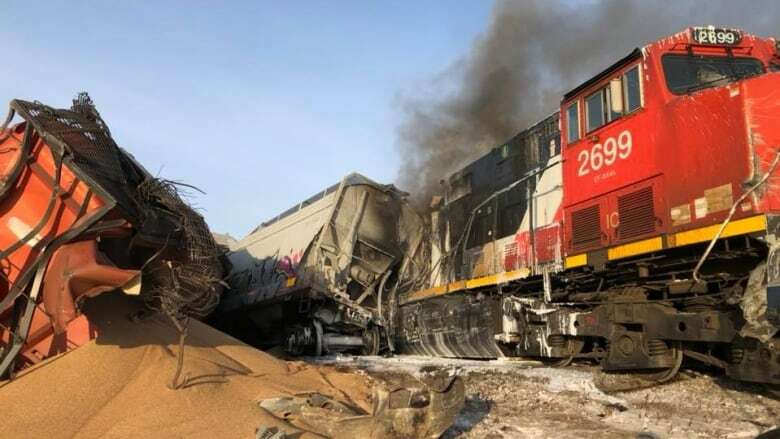 The train, which was hauling grain, was on a Canadian National Railway line near Highway 11 and Wanuskewin Road. The Saskatoon Fire Department received the call around 9:26 a.m.and found a locomotive leaking diesel and on fire. The fire department said 30 of the train's 52 cars were derailed. Eyewitness Braden Rein said it appeared as if one of the cars jumped or skipped before it derailed and others crashed into it. "There was at least a dozen cars that crashed before the engine and then a couple afterwards," Rein wrote to CBC. "Wasn't as loud as I had expected, but just a lot of metal crashing into each other." 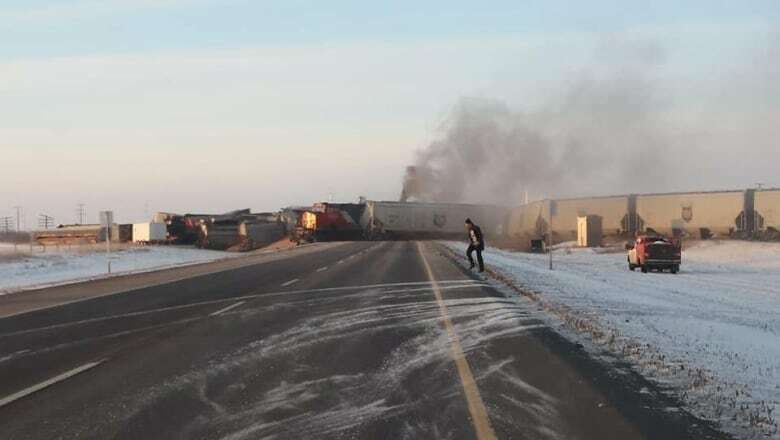 Another eyewitness, Rachel Baird, was on her way into Saskatoon when she stopped for the train. She saw one rail car that was kicking up snow and looked as if it was going off the rails. "So I'm thinking to myself, 'My goodness, this thing is going to tip.' Sure enough, I watch it go over," she said, adding she watched one car after another crash. "It was quite the sight to see." She could hear a repetitive booming following the crash, which she described as a "pulsating noise." When someone warned her there was leaking fuel at the site, she said she quickly moved away from the scene. "What we're dealing with is flowing fuel," Assistant Fire Chief Wayne Rodger said. "It's a matter of trying to isolate that so we can continue with extinguishing it." Video shows fire rising from the rail cars, while CN confirmed the locomotive fuel tank is leaking. 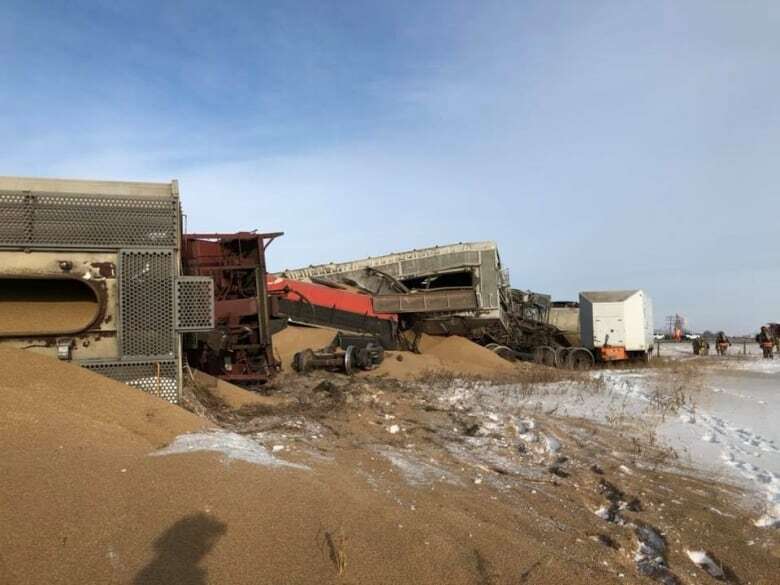 Crews from Warman have been called in to assist crews already on scene, while CN said it has its own crews also responding to the incident. Social media posts show flames and smoke on scene. Tankers from Warman and Dalmeny are on the scene and assisting in bringing the fire under control. In a statement, CN said there is no danger to the public, with no dangerous goods involved and no injuries reported. The southbound lane of Highway 11 heading into Saskatoon is now open, but the northbound lane is still closed. Residents are encouraged to avoid the area. Motorists should be prepared to take a detour if travelling in the area. CN said the cause of the derailment is under investigation. A previous version of this story stated fire crews from Delisle, Sask. were assisting. In fact, it was crews from Dalmeny, Sask.